Room #1 has a private enclosed porch and a private bath with a combination tub/shower. All other rooms have a private bath with a shower. Rooms #1, #2, #4, #6 and #8 are our most spacious and on the first and second floors. All rooms (except "The Den") have a refrigerator, microwave, eating area, sink and private bath. "The Den" is on the first floor and has a private bath (as do all of our rooms). Only "The Den" has air conditioning and a dormitory size refrigerator (all other rooms have a much larger refrigerator). "The Den" has a microwave but does not have a kitchen sink. It has a double bed and is a comfortable room for one or two people. Rooms #10, #12, #13, #14, #16, and #17 are comfortable for two people. Room #10 is on the second floor. The remainder of these rooms are on the third floor. The Chautauqua Inn offers a warm and quiet atmosphere in a remodeled Victorian House. Each room has its own private bathroom, refrigerator and microwave. Chautauqua's architecture is noted for its abundance of porches. 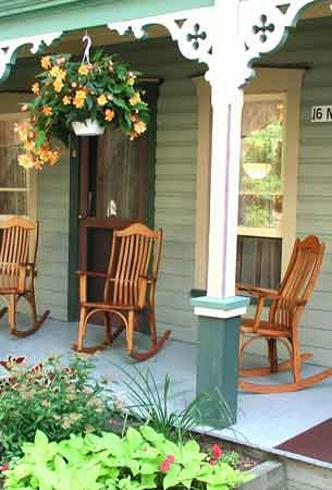 The Chautauqua Inn has four porches and two decks offering the best in rocking chair comfort. The porch, a place to read, relax, or create. We are open throughout the Chautauqua Institution's summer season and are now accepting reservations for the 2018 season. Harry and Nancy White and their daughter, Lauralynn, are the inn keepers of the Chautauqua Inn. 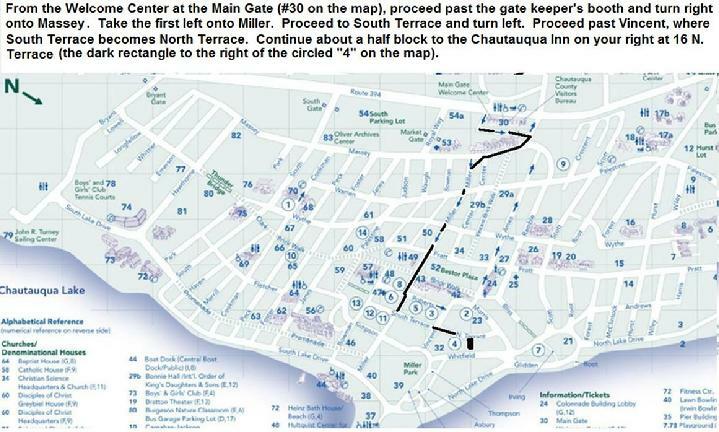 We are located on the grounds of the Chautauqua Institution, a beautiful and vibrant summer community. We want to share our love of the Chautauqua Institution with our guests. Join us for a wonderful experience.